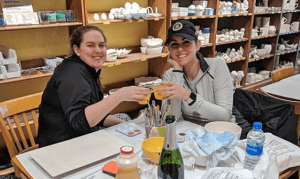 Invite your group to enjoy a creative bridal shower by painting pottery from a wide variety of items that are unique and distinctive. Have your group all paint a set of dishes using the same colors then the bride will have a personalized set. Some of our most popular items include plates and mugs to create a breakfast or dessert set, cake plates and unique size platters. Everyday kitchen supplies like a salt and pepper set and a spoon rest are also enjoyed. Items that you paint and create will last a lifetime. Best of all, they will be glazed and fired in our kiln — ready for pickup when you return from your honeymoon. 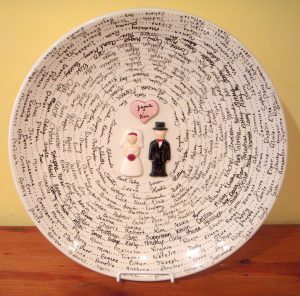 Most wedding guests sign a registry book at the time of the Reception. But what happens after the wedding? We have a terrific alternative. 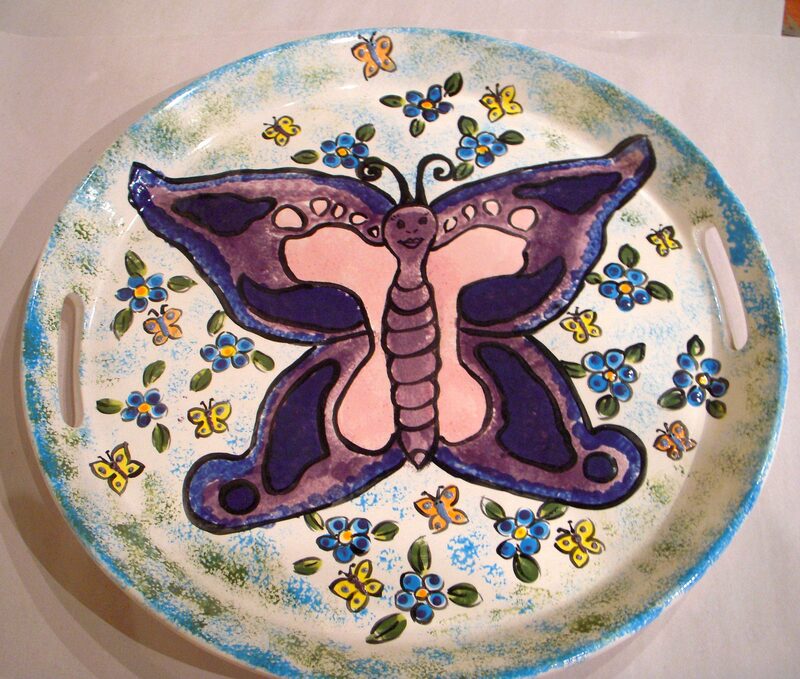 Have your guests sign a platter with our special glaze pencils or paint. It is food safe and will make a very interesting centerpiece on your table. We will have it ready for you one week later. Paint a unique item for the members of your bridal party. It’s a great way to commemorate the event that is so special for all of you. We have beautiful jewel boxes, picture frames, plaques, and much, much more. You can then tailor each piece to the friend you’re giving it to. Babies can get involved, too. Your baby’s hand prints and/or foot prints on a mug, plate or platter look so great. The paints are lead free and nontoxic, so they’re safe for your children. First, we paint their hand and press it down on the piece. If it doesn’t turn out the way you want, we can wash it off and start again. At six months, you can do another type of project. Hand and/or foot imprints in clay. This requires a reservation and the pick up time is longer, but the memory is everlasting. At all of these events, you can serve beverages, including wine or champagne to add to the ambiance of the day or evening. Food? No problem, we will work with your catering service and help with the set-up for your special gathering. Call to make a reservation. In addition, you can reserve the entire studio for your very own private party! You can bring food and beverages, including beer & wine. We’ll make your private party a one of kind experience. *Note: We require a 3 week minimum advance notice to guarantee space availability. We only book 2 studio rentals per studio a month on the weekend. So, on any given month there can only be one rental per weekend. You are given 2 hours for private studio rentals, more time can be given for a pro-rated fee. Reservation Fee: $65 This is non refundable and is paid at the time of reservation. Cost of pottery, not included in party rental fee. Bethesda Studio: 55 People Max. Cleveland Park Studio: 45 people Max. Minimum of 20 painters to Rent the Studio out.